What’s in a name? Many an entrepreneur has agonised over naming their company, product or invention. I went through the same pain, identifying great word combinations only to find the domain names already taken. I tried numerous combinations, but in the end I liked and settled on Analysis Logic. This article shows the reasoning behind the name. Detailed examination of the elements or structure of something; separation into simpler constituent elements. Science of reasoning; a system or set of principles underlying the arrangements of elements in a computer or electronic device to perform a specified task. Google Analytics? No, we don’t. Data analytics? Not really, yet. So, it seems like I need to explain how the name came about. Part 1 (Analysis): I am a very analytical thinker and have a long background in analysing problems to produce requirements and pragmatic workable solutions through to long term product roadmaps. Analysis of the business requirements as well as technology suitability and marketplace trends is vital for the best outcomes. Part 2 (Logic): I have been designing, developing and managing technology solutions from electronic interfacing of IT systems through software development to business IT infrastructure all my professional life. Such technology must adhere to logical rules in order to operate and perform to the remit. So, when I came to set-up my own technology company it seemed sensible to base it on what I am good at and what technology solutions must be (logical). We analyse your business needs to define workable requirements to suit your organisation. We then use this to help you deliver a logical information technology solution. 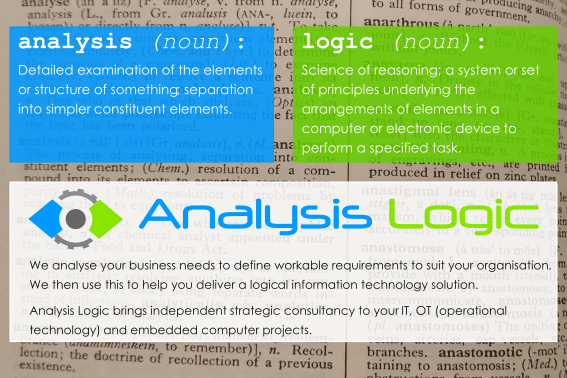 Analysis Logic brings independent strategic consultancy to your IT, OT (operational technology) and embedded computer projects. Simple. Well, the tasks may not be so simple, but I think the name is. Hopefully the content on our website will help you understand our offerings to discover, recover or create an IT strategy for your organisation. From an audit of your existing computing and other information technology base (software and hardware) to helping you deliver a longer term change programme or new product line, we can help. For the bits we don’t do, we work with Company Connecting to help you procure the most suitable vendor. No restrictive partnerships, just objective transparent advice.